Hairspray Boycott Gains Visibility - Joe.My.God. In a story picked up by today’s NY Daily News, Washington Blade editor Kevin Naff is joining the chorus of critics calling for a boycott of the new movie version of John Water’s Hairspray, charging that star John Travolta’s faith, Scientology, is homophobic. I haven’t mentioned the boycott previously, because I didn’t think much would come of it, but the story has gained a lot of traction in the last couple of days, with coverage yesterday in the Huffington Post and on Hollywood.com. The Daily News contacted the New York Scientology headquarters to request their position on homosexuality, and were told, “Scientology doesn’t try to tell people what their sexual orientation should be. The emphasis is on helping people survive better in the world. If a person comes into Scientology and they are involved in doing anything that they consider detrimental to their survival, then they can change that compulsion.” Yeah, compulsion, that’s the word for it. I’m a bit torn on this. Travolta has never uttered an anti-gay peep, as far as I know. And while I can guarandamntee you that I will never again view a Mel Gibson or Tom Cruise movie, that’s because they opened their big yaps to spout their batshit philosophies. For the moment, I’m happy to let Travolta be privately crazy, without it affecting my attendance of his movies. 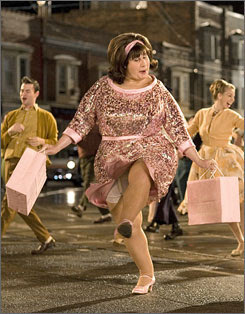 However, I’m also ready to spin on my heel and go the other way, should Travolta’s private crazy go public. Next Marriage Equality Preserved In Mass.